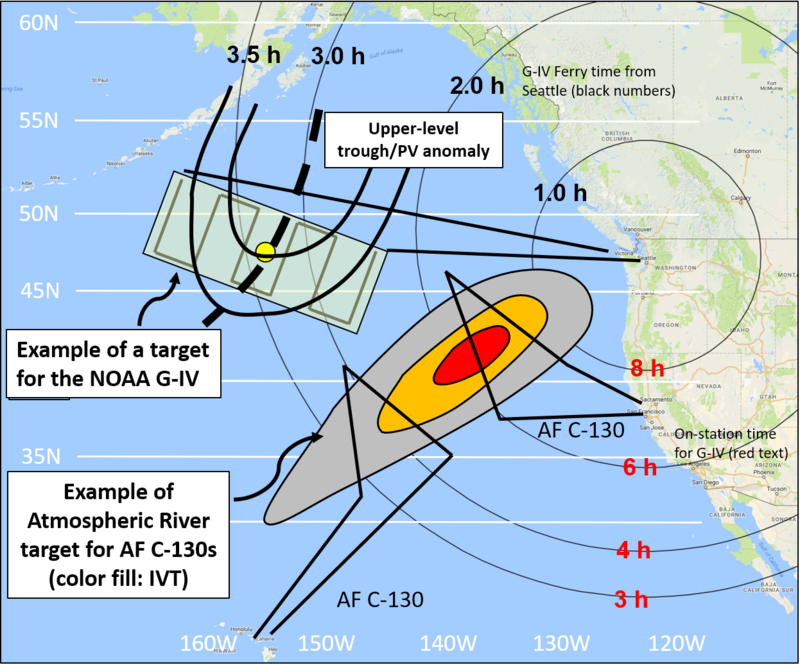 Goal: Support water management decisions and flood forecasting by developing and testing the potential of targeted airborne and buoy observations over the Northeast Pacific to improve forecasts of the landfall and impacts of atmospheric rivers on the U.S. West Coast at lead times of 1-5 days. Innovations in targeting methods, data assimilation and regional forecast skill requirements are pursued through collaborative, cross-disciplinary, science-based strategies. CW3E works directly with water managers in the West to develop science and tools designed to better prepare for the variability inherent in the western US climate. 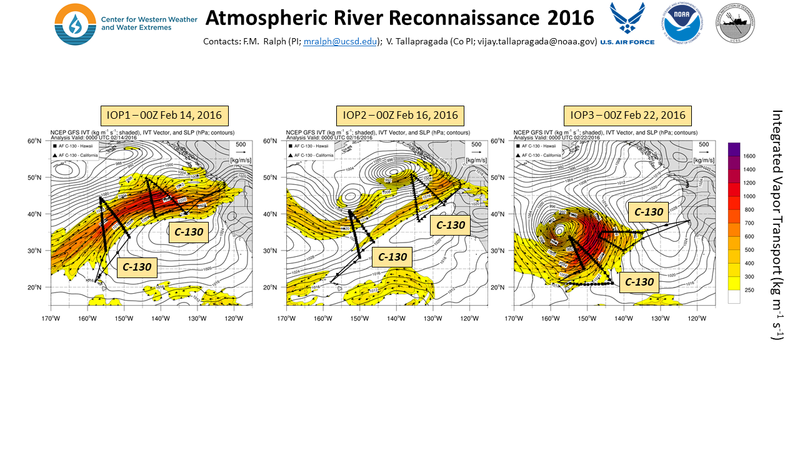 Atmospheric River (AR) Reconnaissance (AR Recon) campaigns support improved prediction of landfalling ARs on the U.S. west coast. ARs are a type of storm that is key to the region’s precipitation, flooding, and water supply. 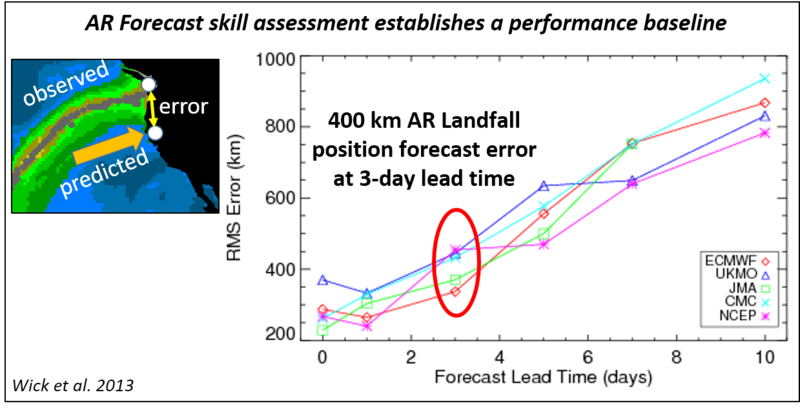 Forecasts of landfalling ARs are critical to precipitation prediction and yet are in error by +/- 400 km at even just 3-day lead time (see figure to the right; Wick et al. 2013). The concept for AR Recon was first recommended in a report to the Western States Water Council (Ralph et al. 2014) that was prepared by a broad cross-disciplinary group in 2013. AR Recon was conducted with 3 missions in 2016, 6 in 2018, and 6 in 2019 (shown in figures below). USACE and the California Department of Water Resources were key sponsors of the AR Recon 2018 and 2019 campaigns. Summary of flights for the IOPs in 2016 (left), 2018 (center), and 2019 (right). Colorfill and vectors on the maps represent Integrated Vapor Transport (IVT), contours show sea level pressure, flights tracks are shown by black lines, and dropsonde locations with various symbols. Aircraft that are normally used for hurricane reconnaissance were deployed over the northeast Pacific to collect observations to support improved AR forecasts. The data were assimilated by global modeling centers in real-time. These aircraft included two of the Air Force 53rd Weather Reconnaissance Squadron’s WC-130J Hurricane Hunter aircraft, and in 2018, the NOAA’s Gulfstream IV (G-IV). An example flight strategy utilizing these three aircraft is shown to the right. The primary data collected were from the release of dropsondes, which record temperature, wind, and relative humidity at very high resolution throughout the atmosphere. In 2018, Scripps researchers flew additional instrumentation aboard the NOAA G-IV to characterize the upper atmosphere poleward of the ARs. A simplified version of the GNSS Instrument System for Multistatic and Occultation Sensing was used to measure profiles of the atmospheric environment to the sides of the aircraft while dropsondes measured profiles directly below the aircraft. 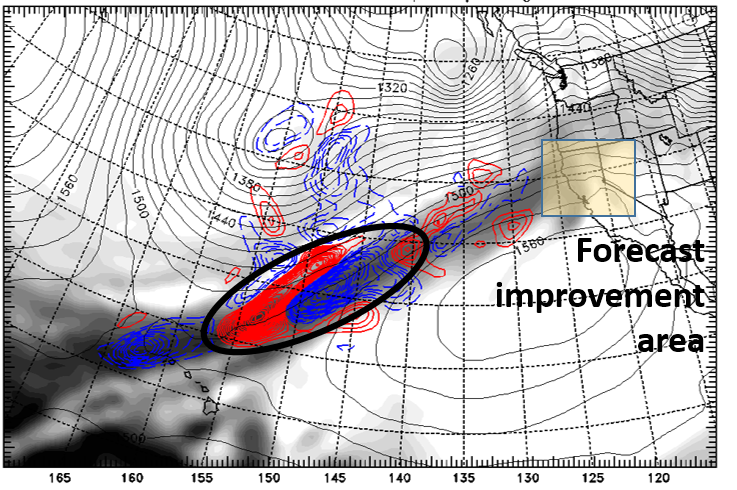 Color contours show the forecast sensitivity to 850-hPa water vapor (grey shading) uncertainty for a 36-hour precipitation forecast over Northern California. Figure from J. Doyle. 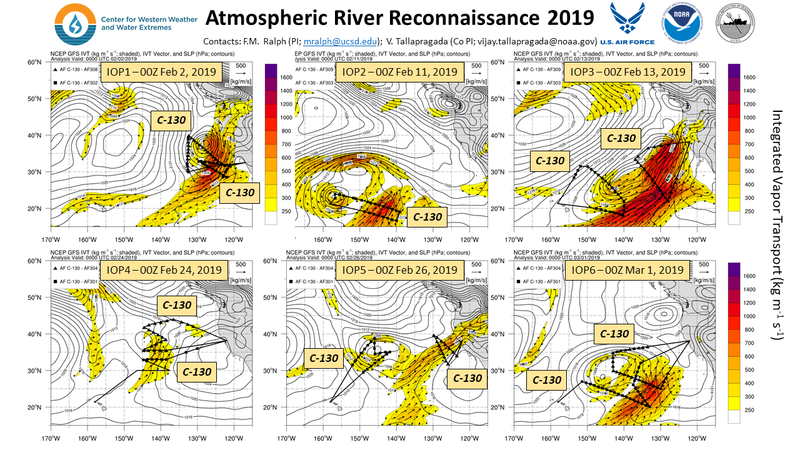 AR Recon in 2018 and 2019 made use of different models that quantitatively pinpoint locations of greatest sensitivity in the forecast – which is centered typically on the atmospheric river core (forecast example to the right). This moisture sensitivity is substantially larger than temperature, wind, or any other sensitivity. The field campaign refined how the tools work, and that information was combined with knowledge of dynamically significant meteorological features such as the upper-level jet, cold-air troughs, and other features to specify each mission’s detailed flight tracks. The targeted dropsonde profiles collected in the otherwise data sparse ocean may be part of the solution to improve AR predictability. Not only were these data assimilated into operational forecast models, but the information collected will be used in research studies to further understand the dynamics and processes that are the main drivers of key AR characteristics such as strength, position, length, orientation, and duration. Below is a table summarizing the aircrafts used, number of dropsondes deployed, and the number of dropsondes assimilated into NCEP, ECMWF, and U.S. Navy atmospheric models for each IOP during 2016, 2018, and 2019. *During 2016 the NOAA G-IV and NASA Global Hawk conducted research flights as part of the NOAA El Niño Rapid Response (ENRR) field campaign. The Global Hawk partially sampled ARs in coordination with the AR Recon C-130s. The G-IV sampled tropical conditions south of Hawaii based on ENRR’s primary airborne objectives, which focused on tropical convection. For more information on the ENRR Global Hawk and G-IV flights, see Dole at al. 2018 (Bull. Amer. Meteor. Soc.). Note: Some assimilation data not available for 2016 campaign. 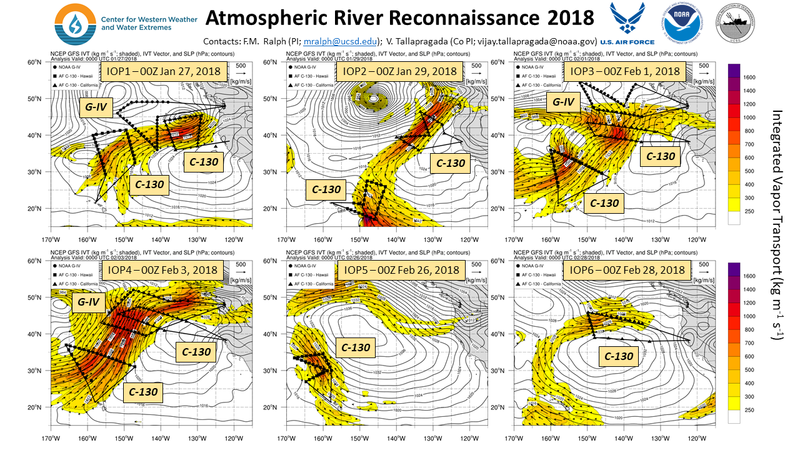 Data is also provided on this website for the CalWater campaigns, which were scientific field studies to better understand the dynamics of ARs offshore and aerosol transports.